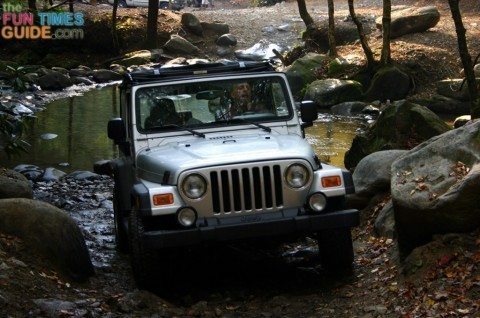 If you’re thinking of taking your Jeep — or any other vehicle — offroad for the first time, I know how you’re feeling. I’ve been there. No matter how good a driver you are, offroad driving is different from driving on paved roads. So it only makes sense to take a few minutes preparing yourself and your vehicle for your first trip offroad. #2 Before you venture too far offroad, it’s also wise to see how your vehicle handles on narrow roads, steep inclines, and even through creeks if you have some drivable ones nearby. (In middle Tennessee we have plenty of these!) Take the time to practice on gravel or dirt roads first to get a feel for stopping and accelerating on various types of terrain. ORV Parks – They charge small daily use fee. There are usually lots of different trails to choose from, ranging in difficulty from beginner to advanced. There are also lots of fellow offroaders enjoying the trails and the great outdoors with you. Here’s an example of an ORV park: Turkey Bay ORV Area at Land Between The Lakes. U.S. Forest Service roads – These areas are very seldom traveled by everyday drivers; they’re used mostly by Forest Rangers and state workers. There’s no charge to ride on these roads that you’ll find off the beaten path, just make sure you get a map before you go from the nearest Ranger station! Here’s what you need to know about Forest Road Maps. #5 Take the time to compile an offroad checklist that you will change and modify over time as you get more familiar with offroading. You can use one of these offroad checklists as a guide. Keep yours handy and refer to it each time you venture offroad. #6 Don’t ride alone. In addition, always tell someone else where you’re going and when you’re planning to return. Again, better safe than sorry. Check out these reasons to join an offroad club.